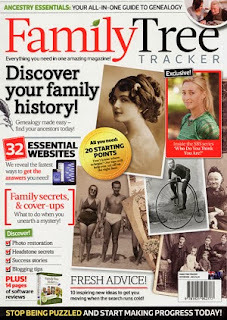 Over the past few days within my social media circles I have seen a magazine mentioned "Family Tree Tracker" due to the comments made I decided to see if it was in my local newsagent and to my surprise it was! What did I think? It is a great resource. Why? because it highlights some things I knew, but added some information that I didn't AND in reading it I also thought...and what about this resource or that resource, which is in no way meant to criticise but to highlight that the articles did get me thinking. The article on "inside the SBS series 'Who Do You Think You Are?" was also an interesting read. So was it worth the money, honestly - YES. Would I recommend it - YES, especially to those starting out, it is a good start point. Now apparently it is a one off run - which I think is sad. But perhaps as others have suggested the power of the people may change that.... I personally think a quarterly or bi annual magazine would be great so let us all get behind this magazine and support another Australian venture. If you do purchase the magazine I would love for you to post your reviews in the comments!